Camp Ba Yo Ca, located in the foothills of the Great Smoky Mountains, provides an ideal setting for Christian camping programs and church retreats. 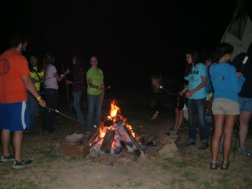 The camp is owned and operated by the Knox County Association of Baptists and is located on 350 acres of beautiful woodland. The Camp facilities can accommodate a variety of groups including children, youth, couples, and senior adults. All retreats and programs are to be conducted in keeping with the primary purpose of Camp Ba Yo Ca as a spiritual retreat center. The goal is to provide a place where individuals can enhance their spiritual growth and share their experience with others. 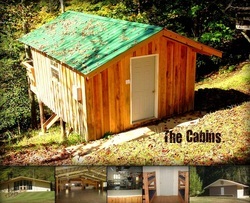 ​To make a reservation please call 865-453-6274 or email camp@campbayoca.com. 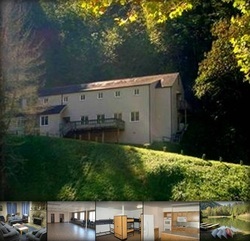 The Jett Lodge is for groups ranging from 40 to 76 people. Downstairs has a living area with a fireplace, seating around a coffee table, large kitchen, eating/meeting area, bathroom and a private bedroom. Upstairs you will find two sleeping areas with bunk style beds, two large bathrooms, and two private bedrooms. 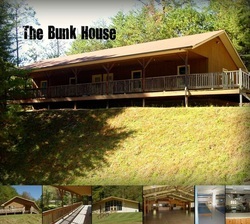 The two Bunk Houses are for groups ranging 40 to 70 people. Each Bunk House can be divide into two sides and has bunk style beds. Prepare your own meals in the Nelson Dining Hall. Use this extra large area for cooking, eating and meetings. It has a projector, fireplace and a beautiful view. 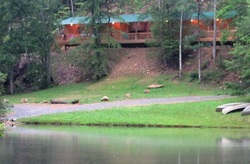 The Cabins are for groups with up 40 people. Each cabin has heat and air conditioning, four bunk beds and will sleep 8. The bathhouse has two sides and is located in the cabin area. Prepare your own meals in the Bath House Addition. Use the large addition area for cooking, eating and meetings. All the Cabins have a back porch with a view of the beautiful mountains that surround them. The Lake House is for groups with up to 32 people. The Lake House is our newest retreat facility that will be available spring, summer, and fall. It has two sides, each with a bathroom , and bunk beds sleeping 16. The Craft Hall has the meeting and kitchen facilities that also overlooks the Lake. Two spacious rooms where you can set up for meals, worship, or games. Camp offers a rustic campsite with 6 covered shelters and fire pits. The campsite is accessible by a short and pleasant hike to its location just outside our Frontier Adventure area. This area is great for father/son retreats or those wanting to try backpacking but still have the amenities of camp. Please call the office for pricing and availability.